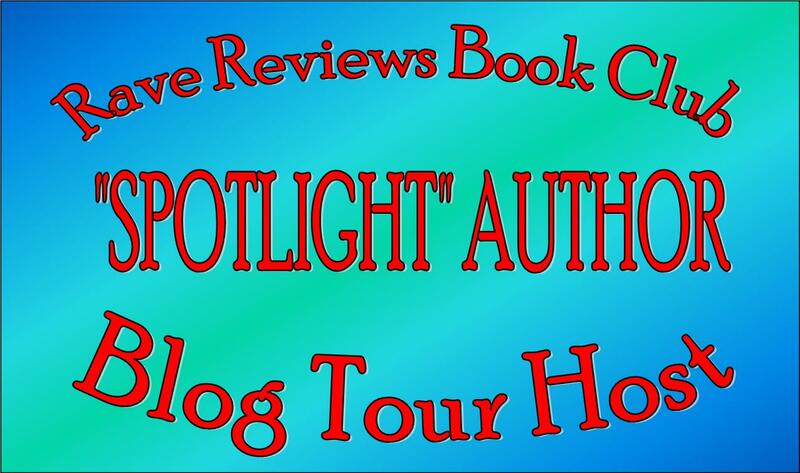 Welcome to “FINDING BILLY BATTLES TRILOGY” Blog Tour! 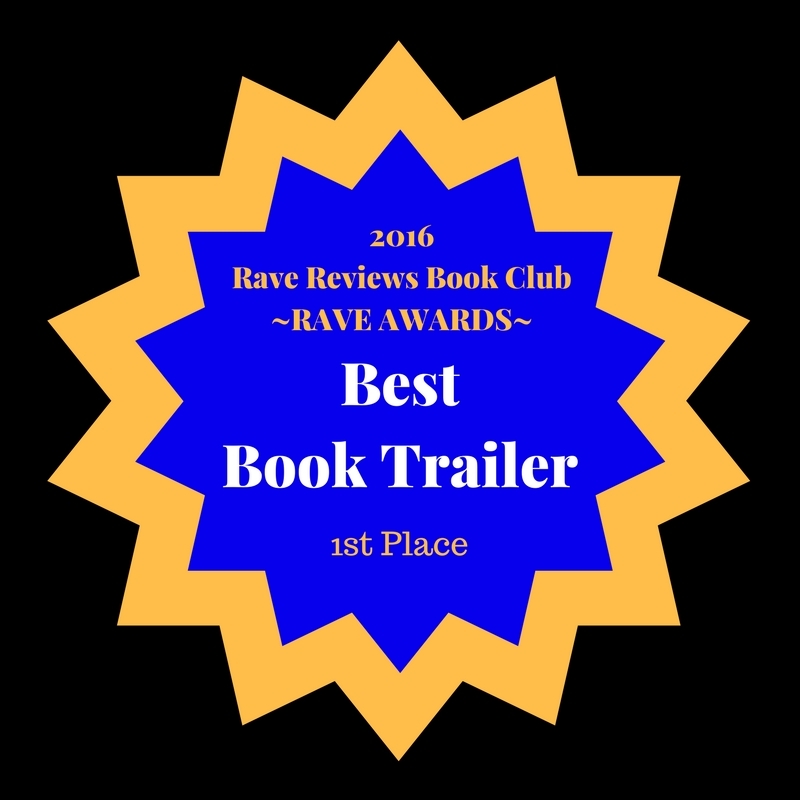 @JHawker69 @4WillsPub #RRBC #RWISA | The Indie Spot! 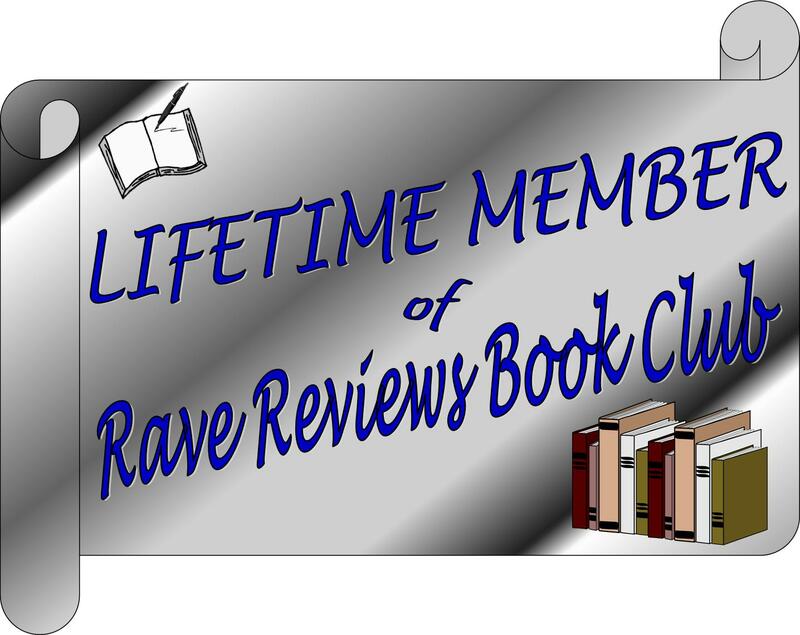 Today, I have the honor and pleasure of hosting author, fellow Blog Talk Radio host, RRBC member, and friend Ronald E. Yates here on The Indie Spot. 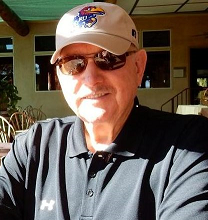 Please give a warm welcome to Ron by leaving a comment below and sharing his post. Take it away, Ron. . .
My first meeting with William Fitzroy Raglan Battles was on a warm June afternoon in 1958. We sat on the veranda of a red-brick dormitory building on the grounds of the Wadsworth old soldiers’ home in Leavenworth, Kansas. Battles was really old, and the truth be known, he kind of frightened me, though I didn’t let on that he did. I was only twelve at the time, and I didn’t even want to be there. Chances are you have never heard of William Fitzroy Raglan Battles, and there is no reason why you should have. I know I hadn’t—until that humid afternoon in the waning days of the Eisenhower era. Today, I often wonder how I could not have known about Battles, how a life as full and audacious as his could have gone unnoticed for so many generations. God, how I wish I could have known him better. But his life—as was no doubt the case with that of millions of other anonymous participants in history—was simply lost, crushed underfoot in the unrelenting stride of time. 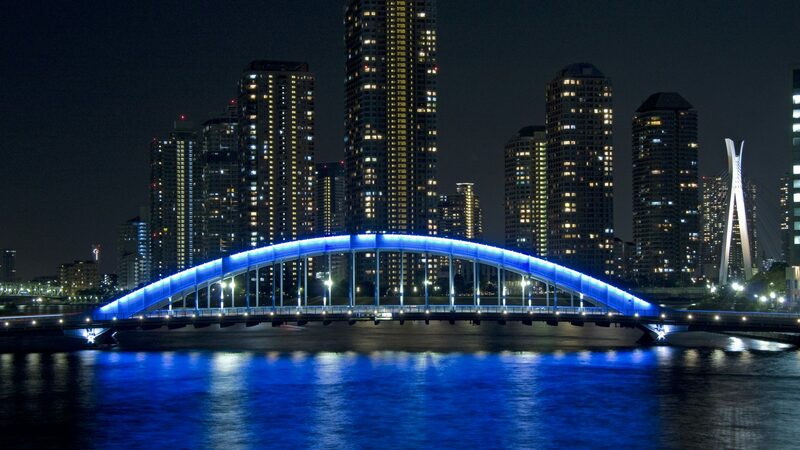 Of course, there was no way I could know at the time that this meeting would trigger a series of events that would lead me on an extraordinary journey into the past and change my life in ways I could never imagine. When I look back on that first meeting, I wonder why I was so fearful. William Fitzroy Raglan Battles was not a particularly menacing man. But there was a definite hardness to him—the kind of stern, leathery countenance that you get from taking, and perhaps giving, too much punishment over a lifetime. I particularly recall his eyes. They were the color of pale slate, and almost as hard. Maybe that was what frightened me—those eyes and the way they cut into you. It was my grandmother who had insisted that I meet the man with those flinty gray eyes and that gristly exterior. 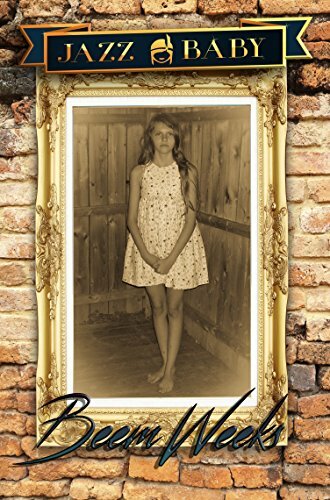 One day she simply announced that we were going to drive to Leavenworth, to meet her father—my great-grandfather. That winter, my father had suffered a fatal heart attack, and my mother thought it would be a good idea if I spent the summer with my cousins on their farm near Troy, Kansas. Most of the time, I roamed the hills by myself, riding horses and occasionally helping out with the chores. I wasn’t thrilled about spending an hour in the car with my grandmother driving the forty-five miles to Leavenworth. First, she drove really slowly; and second, I didn’t even know I had a great-grandfather. Nobody, including my grandmother, had ever really spoken about him—at least not in my presence. Why this was the case I was to learn much later when I was older and could “understand such things,” as my grandmother put it. The only explanation for this visit that I was able to extract at the time from my grandmother was that she wanted me to go with her because the home was commemorating the sixtieth anniversary of the outbreak of the Spanish-American War, and my great-grandfather and several thousand other Kansans had played a significant role in it. Big deal. The Spanish-American War. Who cares? I thought as my grandmother maneuvered her pastel-blue 1957 Cadillac Fleetwood Brougham south down State Highway 7 through the undulating farmland of northeast Kansas and into Leavenworth. The Spanish-American War was ancient history. And besides, being around so many old people made me nervous. Death had taken on a new meaning for me. It was no longer some abstract event that happened to others. I had seen and felt its uncompromising manifestation when the emergency crew carried my father from our home several months before. And now I would be in the presence of someone who could die at any time. Those were the kinds of self-indulgent thoughts that pranced through my adolescent brain that day. Today I know a lot more about my great-grandfather. The biggest regret of my life is that I was too young and too obtuse to understand what kind of human history database my great-grandfather was. I would only learn that many years later when, as a journalism student at the University of Kansas, I began to appreciate the value of personal narratives from people who could speak firsthand about events I could only read about. That’s the way it is when we become absorbed with history. We discover that the events and people of antiquity are not ghosts, or simply lifeless words on a page, or fading sepia images. They have an essence we can touch and hear and even speak to if only we have the right medium—someone who has experienced the past with passion and perceptiveness and has the keen senses with which to make it come alive to those who, until that moment, could only fantasize about it. In this case, that medium was a rare individual who lived during what might have been the most tumultuous years in American history. Luckily, my grandmother, intractable and single-minded as she was, made sure that I would not forget this event or my great-grandfather. 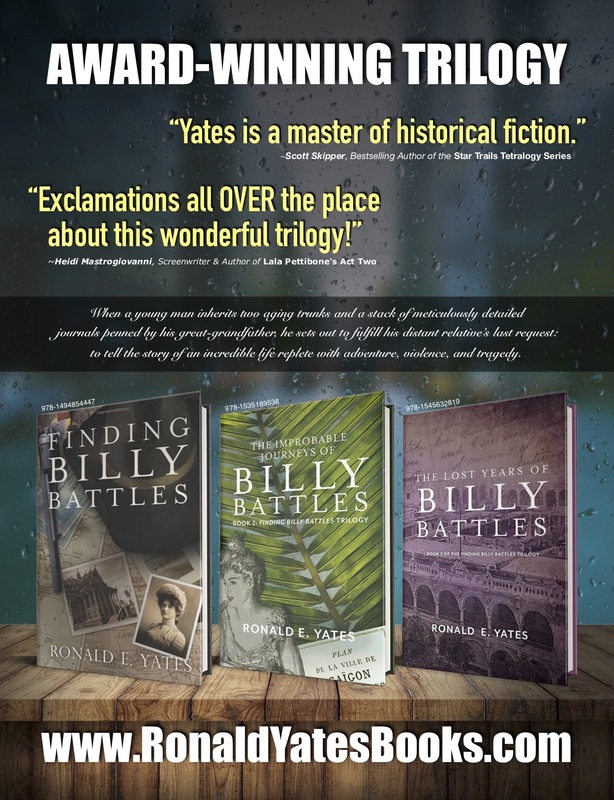 Ronald E. Yates is an award winning author of historical fiction and action/adventure novels, including the popular and highly-acclaimed Finding Billy Battles trilogy. His extraordinarily accurate books have captivated fans around the world who applaud his ability to blend fact and fiction. Ron is a former foreign correspondent for the Chicago Tribune and Professor Emeritus of Journalism at the University of Illinois where he was also the Dean of the College of Media. His award-winning book, “The Improbable Journeys of Billy Battles,” is the second in his Finding Billy Battles trilogy of novels and was published in June 2016. 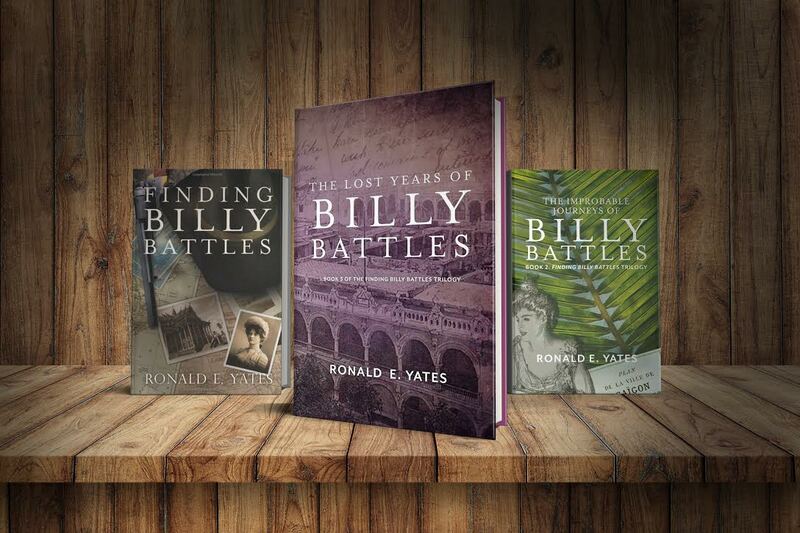 The first book in the trilogy, “Finding Billy Battles,” was published in 2014. 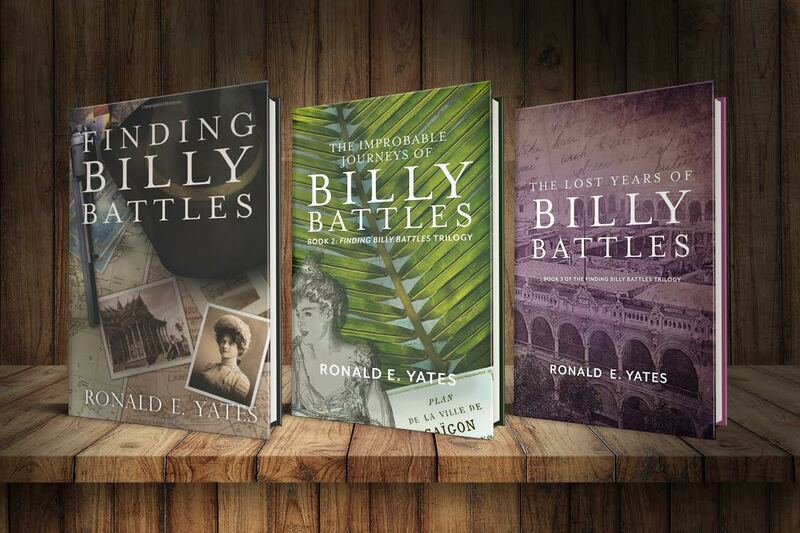 Book #3 of the trilogy (The Lost Years of Billy Battles) was published in June 2018. As a professional journalist, Ron lived and worked in Japan, Southeast Asia, and both Central and South America where he covered several history-making events including the fall of South Vietnam and Cambodia; the Tiananmen Square massacre in Beijing; and wars and revolutions in Afghanistan, the Philippines, Nicaragua, El Salvador and Guatemala, among other places. His work resulted in multiple journalism awards, including three Pulitzer nominations and awards from the Society of Professional Journalists and the Inter-American Press Association, to name a few. This entry was posted in authors, Blog Tours, Books and tagged 4 Wills Publishing, authors, authors' community, Book Clubs, Fiction, Finding Billy Battles, indie authors, Rave Reviews Book Club, Ron Yates, Ronald E. Yates, RRBC, RWISA, The Billy Battles Trilogy, The Improbable Journeys of Billy Battle, The Lost Years of Billy Battles, writers, writers community on March 10, 2019 by beemweeks. I am truly honored to have you and Billy here, Ron! 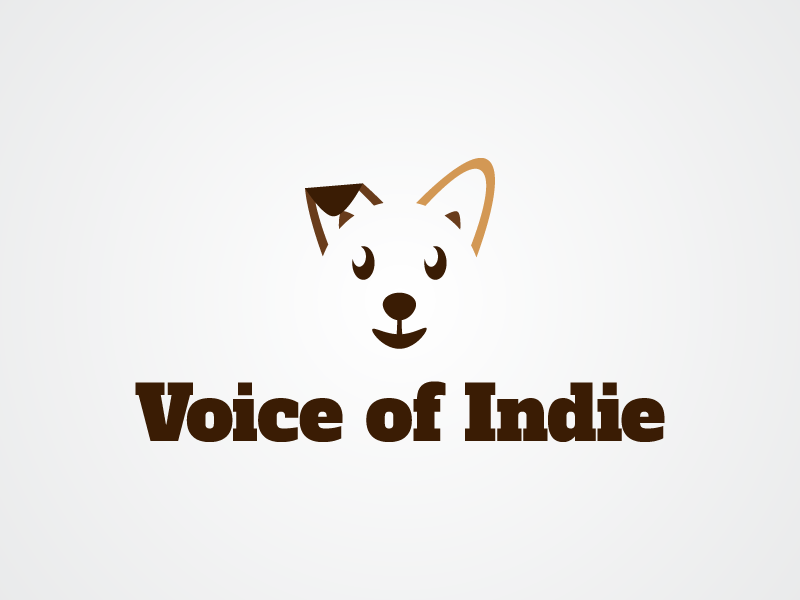 Thank you for gracing my blog with your presence! Hi Ron. History has a way of exciting you when you are researching. Its more exciting when its about someone close to you. I will get to your book(s) soon. Have a great tour. Thanks Beem for always being the perfect and dependable host. Thanks for stopping by, Shirley. You are right about researching history. Thank you for always being such an wonderful supporter and an incredible human being, Shirley! Beem, what a nice thing to say. Thank you for being so kind. I say it because I mean it, Shirley. This is the perfect setup excerpt, Ron. I’m intrigued to read more about Billy and his life. Thanks, Ron and Beem! Thanks, Stephen. I hope you enjoy Billy’s life and journey. Never a dull moment! Thanks for the visit, Stephen. I recall this prologue so well and smiled in understanding again as I reacquainted myself with Billy and the wonderful writing style of the author. Thank you for your gift, Ron. Billy and company took me on a marvelous and memorable journey. Thanks for hosting Ron today, Beem. Thank you, Soooz. I’m glad you enjoyed the journey. Billy was happy to have you along! Thank you for stopping by, Soooz! I think I have read books 1 & 2 of the Billy Battle series. The stories can pass as non-fiction, because of the historical details in contained, as well as fiction, because of the romance. Good luck on your tour, Ron, and thank you, Beem, for hosting. Thank you, Joy, for stopping by and for reading books 1 & 2. I tried very hard to keep the historical elements accurate. Good luck on your tour, Joy. My part of your tour is tomorrow–the 12th. Thank you for always being so supportive, Joy! I love this excerpt, Ron! The statement that caught my eye was this: “But his life—as was no doubt the case with that of millions of other anonymous participants in history—was simply lost, crushed underfoot in the unrelenting stride of time.” That says SO much! Thanks for hosting, Beem. Thanks, Jan. I think that phrase sums up life for most of us. We participate, but we are mostly anonymous. Actually, as for me, I prefer it that way. It was great reading this excerpt again after reading all of the books. I see it through a completely different prospective;) This is a series I won’t soon forget:) Enjoy your tour, Ron. Thanks for hosting, Beem. Thank you, D.L. I’m really happy you enjoyed the trilogy! Thanks for stopping by. Hello Ron & Beem & everybody! It is most excellent to find a snippet of Billy Battles here. Congratulations on rounding out the trilogy, Ron. Thanks for the visit, Guy! Thanks, Guy. I wish I could have kept Billy going for another 100 years. Beem, thanks so much for hosting. As always, thank you for stopping by and showing support, Rhani. Thanks for visiting, Rhani. I hope you enjoy the trilogy when you get to it.